This was the reaction a friend gave when I tweeted that I would be seeing the Abbey Theatre’s production of “Our Few and Evil Days” written and directed by Mark O’Rowe, and she was right. This was a stunning production that indeed snatched my breath, inhabited every part of my mind, made me both laugh and cry, and left me reeling as I left the auditorium. There are few shows that have that powerful pause between the final blackout and the applause as the audience absorbs what they just experienced and readjust to real life, but this was one of them. 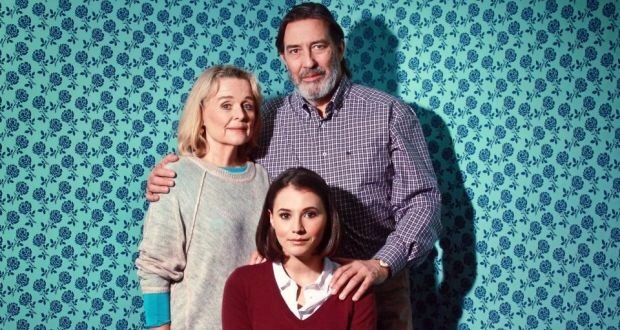 The combination of O’Rowe’s skilled writing and the powerful performances delivered onstage, particularly by Ciarán Hinds and Sinead Cusack, made this piece an exciting, amusing and heart-wrenching experience. Every part of the performances and writing played a part in building the story of this family. The nuances, tone and progression of every conversation were intensely realistic, with each interruption and pause timed and delivered exactly, but with a powerfully natural feel. This was further complimented by the small devices in characterization, such as Hinds’ regular exclamations of “Jesus!” and Cusack’s slow, almost tired speech which portrayed important parts of the characters and story on an almost unconscious level. These performances were strengthened by the excellent design of the stage and lighting. Particularly effective were the blackouts at the ends of scenes which served to build tension and to leave things unsaid that were more potent in their absence than if they had been said. These blackouts were especially effective when contrasted with the well designed, realistic lighting throughout the rest of the production. Finally, I wish to comment on one particular moment which was not central to the plot and could in fact have easily gone unnoticed; I don’t even know if it was intentional. At this point in the play, Hinds’ character was standing at the kitchen sink which had a window above it when the rumble of the Luas passing made its way into the auditorium. Rather than just ignoring it, as is usually done, Hinds’ briefly looked out of the window, as if to acknowledge the passing of the Luas. My pet hate with the Abbey is the sound of the Luas reverberating through the auditorium, breaking the atmosphere momentarily so I absolutely loved this incorporation of it into the production. Whether purposely timed to coincide with the Luas, or just a fortuitous coincidence, this was a gem of a moment. It may seem that I gave a disproportionately large amount of text to that particular moment, but it is significant as it is an example of the many small but powerful devices used within the production that gave it its overall strength and impact. Every aspect of the production combined perfectly to create a visually stunning, emotionally striking and utterly incredible theatrical experience. This entry was posted in Review and tagged Abbey Theatre, Dublin Theatre Festival, Review.